The next panel topic emerged out of our the first. How does one navigate evaluating students’ work? However supportive, attentive, and productive a discussion we foster with our students in a writing workshop or in the margins of their papers, things get tense when it comes time to assign their work a grade. Our students care a lot about grades, as their responses to a recent department survey indicate. Grades are emphatically significant in students’ lives–perhaps especially when they’re still in university: when they’re still taking prerequisite and general eduction classes in hopes of getting a strong enough GPA to be accepted into the professional degree program of their choice. Or when they’re trying to accumulate confidence and get oriented to the institution while warding off academic probation. Or when they’re driven by their own sense of pride and work ethic, as so many of them are, and crushingly worried about achieving a mark that will satisfy them that they’ve earned their tuition money’s worth and learned something that will help them in the future. How does one handle that ultimate, inescapable evaluative moment, as an empathetic person, with any sense of integrity and justice? Colleagues of ours at the University of Alberta occasionally choose not to. The U of A has recently won the prestigious Certificate of Excellence from the Conference on College Composition and Communication, a major international organization, for its interdisciplinary course called Writing Studies 101–a workshop-style course that guarantees students at least a B- if they engage in all the required activities. 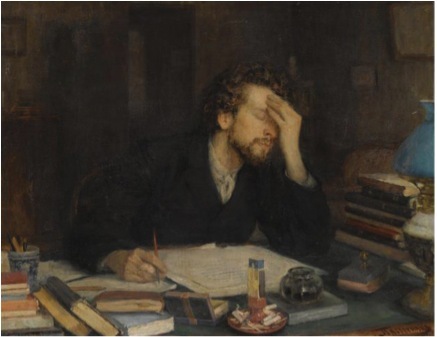 They can get better grades, if their work is excellent, but genuine and responsible participation in the workshop means no-one–student or instructor–has to cope with a C. Or an F.
“Throes of Creation” by Leonid Pasternak ca. 19th C. CC licensed for sharing and re-use. So we gathered, with anticipation, to think together about evaluation. This time we were not given a smoked-glass room or a glowing oval table, but a classroom on the first floor of the Arts building. There was a JugoJuice doing buisiness outside. It was a mundanely pedestrian, functional, but sizeable room with flexible seating: somehow the right space for the conversation. We circled our tables and got down to it. As with the first panel discussion, I found this one illuminating, and I found myself marvelling at the wisdom and savvy of my colleagues. Unfortunately, I’ve lost my notes about this panel discussion–a serious filing error!–so what follows is the faulty record of my erring mind. Since it was Jill’s question that had prompted the panel topic, she went first. She spoke about the compromise she’s drawn in her efforts to evaluate her creative writing students. She teaches poetry-writing classes, and the rich discussions focus on the overlapping energies of craft, process, and the poetic heart. Jill, like her colleagues Richard, Natalie, and Micheline, supports and encourages her creative writing students as expressive people, as artists working to render experience and imagination on the page. But when it comes down to evaluating their work, she says, she retreats to a focus on form, on craft. This seems gradable; the soul of the work, the personal practice of the artist, does not. That was the compromise she’s been drawing. It’s not fully satisfying, she indicated, but it works. Sandi went next, and (as ever, with these panels) the contrast between her teaching context and Jill’s illuminated the diverse sorts of writing students do at a university. When Sandi teaches writing to Public Relations students, she is preparing them to face a demanding and hasty public and professional audience: her grading gives them an index of how well their writing would perform in the busy world, so her feedback is necessarily rigorous. But unlike the silent public, Sandi’s response to her student’s work is informative and instructive: it offers them a chance to learn knowingly from their mistakes, rather than to wonder later what went wrong, when their texts fail to hit a mark. Wanting her responses to be informative, then, she has developed carefully specific rubrics that detail what her students’ writing must do. And the rubrics allow her to highlight precisely where they didn’t do it. The approach works. David followed Sandi, and he told an instantly recognizable story of marking fatigue. How do you escape the frustration that comes when, inevitably, you find yourself needing to say the same things again in the margins of many student papers in a row, or to the same student, again, yet again? David, who teaches literature as well as writing, showed us some software he had developed (somehow, in his spare time!!) that allowed him to generate a remarkably layered, personalized, and informative paragraph of feedback for each student paper, largely by selecting sentences to add from a substantial database of routine comments. Indeed, I say paragraph, but it was a full page of single-spaced type: a ream of relevant and detailed commentary far more readable than the pencil-scrawled paragraphs I’ve often written, and far more patient in tone than mine has often been, towards the bottom of the marking stack. It works!